Thank you to all who auditioned and shared their talent and hearts with us through this process! Tech Sign up is available at https://docs.google.com/forms/d/1ubjyWevFfVXM8tYwhLgCZVyKK1zx2jyuAXpu6Uo-nO8/viewform?edit_requested=true for those of you wishing to be apart of the production in that way. Our first rehearsal will be Monday August 27 at 4:30 in the black box! Lovejoy High School Theatre is proud to present our first mainstage show of the year with one of the most beloved Shakespeare classics, A Midsummer Night’s Dream. The show will be presented September 28th and 30th, 2017 at 7pm. A Midsummer Night’s Dream is about the world’s most popular pastime, falling in love. On one such midsummer’s night, Hermia (played by junior, Marcie Sawyers) escapes from her arranged marriage with her lover Lysander (sophomore, Cy Feagin). They are followed by Demetrius (sophomore, Bryce Fuller), who Hermia is being forced to marry, as well as Helena (senior, Hannah Hansen), who is hopelessly in love with Demetrius. These four lovers become entangled in the dream-like arms of an enchanted forest where fairies and sprites rule, all while being caught in a mess of love potions and plays within plays. From humorous lines to memorable scenes, A Midsummer Night’s Dream is a performance for everyone featuring characters that audiences will adore such as Oberon (sophomore, Joey Chavez) and Titania (senior, Raegan Vaughn), the forest trickster Puck (senior, Jess Luce), and the ill-fated weaver Bottom (junior, Austin Keefer). Tickets are $7 for students, seniors, and staff, and are $10 for adults. Tickets are on sale now at https://tinyurl.com/MidsummerLHS. Thank you so much for auditioning and sharing your talent with me! I had such a blast enjoying your great acting. I hope that you are as excited as I am to start this show! First rehearsal will be Monday, Aug 24 in the Black Box from 4:30 pm – 6 pm. Please bring a binder, pencil, and highlighter and get ready to have some fun! STAGE MANAGER: Mason Taylor L.
ASST STAGE MANAGER: Kyra J. Thank you to everyone who came an auditioned. It was so much fun to watch you guys rock some Shakespeare. First rehearsal is scheduled for Monday, Aug 21 at 4:30 pm in F105. Please bring a highlighter and pencil. Mr. Doyle is so excited to direct his first show at Lovejoy! A classic timeless journey of love, loss, faith, and family. The tradition of great musicals continues at Lovejoy High School with this year’s family- friendly performance of Fiddler on the Roof. The show will be presented January 19 – 21, 2017 at 7 pm. 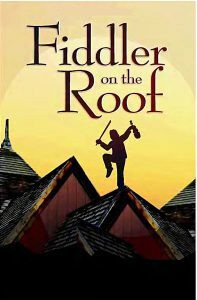 Set in the small Russian town of Anatevka in 1905, Fiddler on the Roof tells a story of faith, family, and tradition. Tevye (played by senior, Trace Glorioso) tries to preserve his family’s traditions in a changing world. He is forced to choose between maintaining his Jewish culture and the happiness of his three eldest daughters Tzeitel (sophomore, Adelyn Maruca), Hodel (senior, Zoe Kahana), and Chava (junior, Renae Haas). From laughter-inducing lines to memorable music, Fiddler on the Roof is a show for everyone featuring characters that audiences will fall in love with, such as Tevye’s endearingly feisty wife, Golde (senior, Rachel Bradley) the local matchmaker, Yente (senior, Abby Yaeger), the village butcher Lazar Wolfe (junior, Vinny Horlock), and the poor lovestruck tailor Motel (junior, Ryan Hyde). The show offers iconic and beloved songs such as “Matchmaker, Matchmaker,” “Tradition,” and “Sunrise, Sunset,” making it a perfect mix of audience-pleasing humor and heart. Tickets are $16 for adults and $12 for students, faculty, and seniors. They can be purchased at our online box office at: http://tinyurl.com/LovejoyFiddlerTickets starting January 10, 2017. Fiddler on the Roof is a heartfelt, moving musical that you and your loved ones will enjoy, so journey down to the Lovejoy High School Auditorium at: 2350 Estates Parkway, Lucas, Texas. Meals will be available for the cast and crew, Monday, January 16th through Friday, January 20th. All meals will include water, veggies/fruit and a small dessert. We do this since the student performers don’t have a lot of time after school before the rehearsal, or show and are STARVING! • Cast party – after the final performance (at the Edwards’s house). Only cast and crew are invited, sorry – no dates. Members of the Booster Club board will serve as chaperones. • Cast Poster – allows space for the cast to autograph their poster, we put them out for all the kids to sign the closing night. We prefer online payment, but if you would like to pay by check or cash, you can send to the Theatre room in Ms. Brewster’s office to put in a locked box. The attached documents were distributed at the cast and crew parent meeting. Due to things out of our control, tickets for Legally Blonde, Jr at WSMS are temporarily unavailable for purchase online. We are working diligently to get the problem remedied as quickly as possible. Lovejoy Theatre is part of Lovejoy ISD. All Rights Reserved.